We offer full service Road Striping. We have the crews and equipment to get it done! We also install road signage and thermoplastic. Line removal and much more! We have all your ADA signs, parking signs, wheel stops and speed bumps to keep your customers safe. 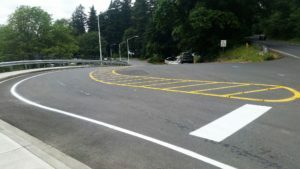 We also do curb painting and custom stencils to keep parking areas organized. 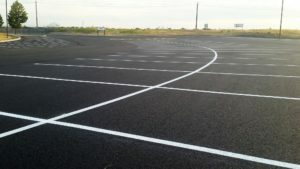 When it comes to Parking Lot Striping, we are the experts! Always free estimates. 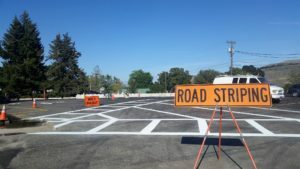 We provide Temporary Traffic Control Services, Bollard Installation, Street & Road signs, Parking blocks, Speed Bumps and Minor demolition for Parking lot construction. When it comes to parking areas, we are the experts! Our crews will be on time and get the project done in a professional manner! We respect your customers and your hours of operation. Our project estimates and new layouts are always free! New parking lots are our specialty! From striping a school to re-striping mega complex, our team is ready for your call! Serving Washington State since 2008!